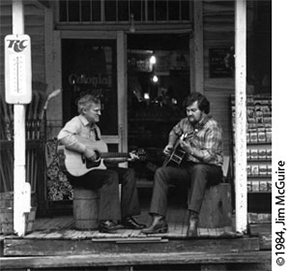 Our discography uses a comprehensive database of Doc Watson's recordings and includes track listings and other information. Because of the large number of albums Doc recorded, you can view the discography information several ways. When you first open this page, you'll the default sort: by the year released (with the most recently released at the top). You can also sort the list by album title, year recorded or year released. Click on the column head link to resort the list. To reverse the current sort order, click on the column head link again. Click on the Title link see the details about an album, including track listing, cover photo and other details. Albums available on CD include a link to Amazon.com for ordering online.